Hearty, flavorful African vegetarian stew. You can substitute parsnips for the Kohlrabis. This stew is great for all seasons. As in all stews you may add additional ingredients but this is our preferred recipe. This stew can be served with buttered noodles, rice or mashed potatoes. If you do use a slotted spoon and dish on plates. Recipe Source: Heritage recipe from Lora White Duffields Recipe Box. 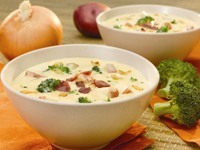 A bowl of Broccoli, Bacon and Cheddar Chowder makes a hearty lunch or simple dinner in no time. Recipe excerpt used with permission. 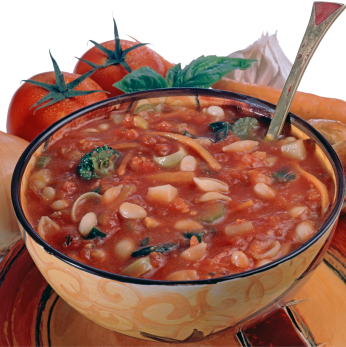 Text copyright 300 Sensational Soups© Carla Snyder and Meredith Deeds 2008 Robert Rose Inc. Purchase 300 Sensational Soups Now! 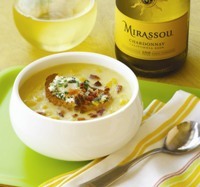 Butternut Squash Soup With Sage Recipe is a show-stopping first course that is accented with the flavors of sweet apples and sage. Frogmore Stew (or Lowcounty Boil) Recipe was provided by Port Royal Seafood. This is a basic Chicken Noodle Soup with Dumplings. It can be served as Chicken, Noodles and Dumplings or you may serve it as a soup. Just add as much broth as you want. Heritage Recipe. This is a recipe that has been passed down for generations. Very easy beef and bean stew. I like to use the beans with the cajun seasoning package included.